Since I have some bloggy friends who post recipes each week, I thought I'd join in the fun. Now, I don't actually do most of the cooking at home — that would be the delightful Sam — so I can't promise this will be a regularly scheduled feature. But, for whatever reason, I love the idea of sharing some of my favorite foods with you. And, for our purposes, I might steal some of Sam's recipes, too, because why not? The Hobo Kitchen will generally focus on meals that are easy or take shortcuts, because that's the hobo way. But they're also really, really yummy — no beans eaten straight from a can here. Though I have done that in the past. 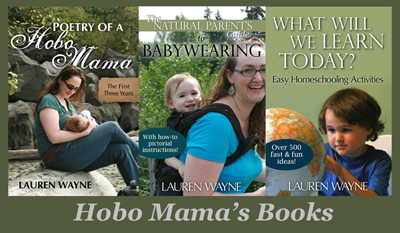 Because I'm a bona fide hobo, yo. I'm also going to assume that you're not an expert cook, because if you are — seriously, why are you coming to me? So I'm going to give you some easy kitchen tips mixed in with the recipe, which you can ignore if you're thinking, Um, yeah, I know. A lot of our meals are vegetarian, though not all, but pretty much none are vegan, because we love cheese. But if you're a vegan whiz at translating cheese out of recipes, feel free to follow along. I've named it this because it's a pretty cheap pesto to make from what you might already have around the home. We've been growing basil in our garden, so I wanted to find a way to feature it. We're also growing garlic, but it's not ready yet. "Real" pesto calls for pine nuts, but have you seen how expensive pine nuts are? I mean, they're awesome — they're worth it if you can spring for them. But if you can't, no worries! Walnuts taste yummy, too. Fancier recipes also call for pecorino cheese rather than parmesan, but I figure more people have parmesan at hand. Any hard Italian cheese will do. So here are all the ingredients, as lined up above. (I take pictures like this so I can remember!) I have no idea on amounts. I guess I used about equal amounts of the basil, nuts, and parmesan, one garlic clove, and then eyeballed the oil and salt and pepper. I really don't think there's a way to mess this up, though, as long as you're using your eyes and your common sense. To put the ingredients together, you need a cutting board and a knife. See, I'm extrapolating Poor Man's Pesto to assume you don't have access to a food processor. Or that you're too lazy to get it out and clean it after. Ahem. Working with real garlic cloves is easy, if you haven't done it before. Just pop out one of the cloves from the garlic bulb and then hit it with the flat side of the knife blade. That will loosen the papery outer layer so you can easily peel it off. You might need to cut an end first, which is fine. Then just cut off the very ends of the garlic clove and throw them into your yard waste or compost. The rest of the garlic, then, you can mince as above. 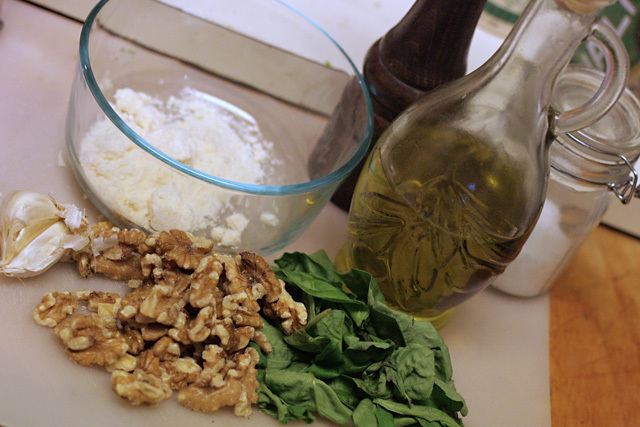 Finely chop or mince the garlic, basil, and walnuts. 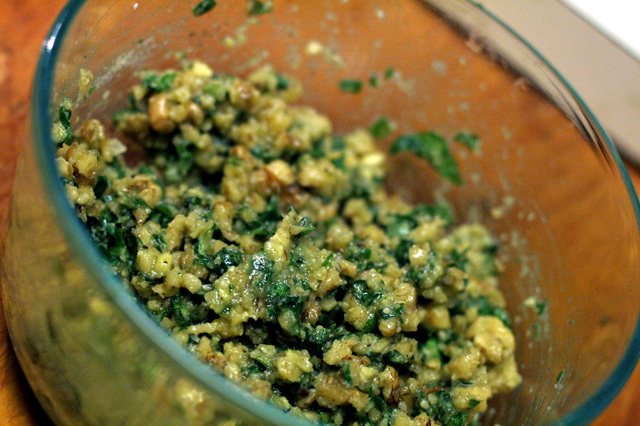 To make a smoother pesto, use a food processor. Otherwise, your pesto will be as chunky or thin as your knife skills allow. I don't mind a nice chunky pesto, though! It's got a nice texture to it. Maybe I should have titled this Lazy Woman's Pesto. Pour in some olive oil, and begin mixing it through. If it looks dry, add more. If it looks sopping, add more parmesan to soak it up. You want the consistency to be nice and oily but holding together. If you're using the food processor, it should be like a paste. Add salt and pepper to taste. I never actually taste as I'm adding, though. I take that directive to mean "as I think will taste good based on how it looks." Now you can use your pesto! We had bagels on hand, so onto bagels it went. 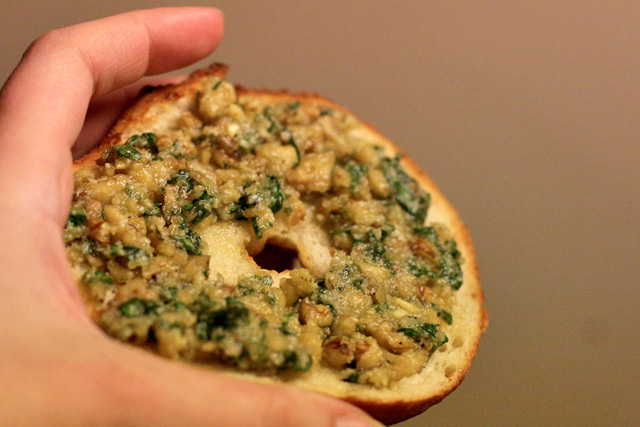 Pesto goes well on top of any breads or toasted under cheese. It makes a divine pasta sauce and can also be added to fish or chicken dishes or pizza. You can use it as is or add it into a tomato-based sauce. Speaking of which, tomato soup becomes gourmet when you add some pesto and a rich grated cheese. You can mix pesto into rice and couscous dishes as well, and it plays well with garbanzo beans. Whatever you choose, wear your garlic breath with pride. If you want to freeze pesto for later use, some say to skip the cheese and add it after thawing instead, but drizzle more olive oil on top of the pesto before sealing the container. You could also add a little lemon juice to help prevent browning from oxidation. (It won't have gone bad, but pesto just looks best nice and green.) You can freeze it in cubes for easier use. That should help you take care of any overgrown basil production in your garden! Linked up at Vegetarian Foodie Fridays at Breastfeeding Moms Unite!, Foodie Friday at Designs by Gollum, Fight Back Friday at Food Renegade, Friday Food at Momtrends, Food on Friday at Ann Kroeker, Wholesome Whole Foods at Health Food Lover, Friday Favorites at Simply Sweet Home. Although I'm a little nervous about partying with these foodie types. Fantastic pesto recipe, complete with handy uses I wouldn't have thought of right away. I love your make-do, low-cost approach. I happened to have some pine nuts from Trader Joe's that weren't so outlandish, but my friend Charity always uses walnuts--prefers them, actually. My husband used to say he didn't like pesto. He'd never order it at a restaurant. Then I told him how healthy it was to eat basil fresh like this, so he gave my fresh pesto a taste test and declared, "I really like this!" At lunch today, he took a big helping and commented again that he really likes it. Pesto's good...and easy...and good for you. Thanks for linking up with Food on Fridays! Looks good to me. I'm made it before with pecans which is another good and cheaper substitute. Divine. The basil is so amazing right now. Great idea. My hubby went to buy some pine nuts in bulk last week for a green bean recipe I wanted to make. They were $28 at the cash register so he put them back. I've been known to make do with almonds and cashews but never walnuts. What a yummy idea. A poor man's pesto can also be made out of other greens too, like spinach or kale. Anyway, I'm so happy to see you at Vegetarian Foodie Fridays! Thanks for linking and for the walnut idea! That sure looks tasty! I have never made it from scratch. Ah, see, I should have known you would all be nice! Here I was nervous for nothing. Ann Kroeker: I keep meaning to go to Trader Joe's but have never gotten in the habit. I hear one is opening up nearer us soon, though, so I will have to go see. I like pine nuts in other things, too, like hummus, so it would be nice to have some affordable ones. The ones at the grocery store were almost hilariously expensive. The story about your husband is so funny. I love it. It reminds me of the first time we served my mom pesto on a family trip, and she said, honest, "Who sneezed on my plate?" And then the next time we saw her, she said, "Oh, honey, you have to try pesto! It's sooo good." And she seriously had no idea she'd disparaged it the first time we'd offered it to her. Thanks for pointing out the health benefits, because I totally agree. The fresh basil (just picked a bunch more from the garden today! ), the raw garlic, the hearty nuts of whatever variety, the lovely drippy oil. Ah! Suzy: I think I've made it with pecans, too. Whatever you've got should work! Nicole Feliciano: I'm agog at how well our basil plant is thriving. And the beautiful scent! Melodie: Oh, man! I would croak. I almost used cashews instead, because that's all we had, but then Sam happened to do a grocery run that day and I told him to pick up something else. I'll have to try other varieties now, and mix up the greens, too. Thanks for hosting the Vegetarian Foodie Fridays! So fun to participate. FrugalMom: i love pesto that other people make, too, but there's something so satisfying and fresh about making it yourself. Your Danish pancakes look so good I'm drooling. This looks utterly fabulous! :D Any idea what us vegetarians can use instead of Parmesan cheese? Parmesan generally has animal rennet in it, which means I can't usually eat shop-bought pesto. The only one I can eat is Sacla Organic which is very expensive so I'd love to be able to make a vegetarian alternative at home! In general, I'd think any hard cheese that's pretty sharp would be yummy, so if you have a vegetarian favorite already that fills the bill, give it a try. If there's a vegetarian pecorino Romano somewhere, for instance, that would be a possibility. Hahaha. I'm just reading this post but I actually made pesto last night, almost exactly as you describe. Basil from the backyard, walnuts to replace the pine nuts. Parmesan, olive oil, salt, garlic (forgot about the pepper). I usually roast the garlic but didn't want to heat the house with the oven, so I fried it. Definitely didn't work the same. I almost used a chef knife, too, but then I decided it would be worth it to lug out the mini-processor. Mikko never eats anything we make, either — at least, not the first 9 times we serve it. The other day, we were having enchiladas again and I almost forgot to offer any to him because he's always refused, but I'm so glad I remembered to, because he ate almost half my plate's worth! :) So give Michael time to come around to the wonder that is pesto. As Sam and I like to say (no, truly), Pesto is the besto! Yeah, I pretty much always offer what we are eating...he usually comes around eventually. It's just that--this was the FIRST time he refused a pasta dish! I made this. Oh MY GOODNESS it was SO GOOD!